As potential transfer deal makeweights go, Barcelona’s Alexis Sanchez is set to be the biggest golden exchange since Keith Gillespie was traded on to Newcastle United. Representatives from Liverpool and the Catalan club are currently discussing a potential switch that looks set to take Pool’s hitman Luis Suarez to Spain. And Sanchez is the sticking point, with the 25-year-old forward the man in the middle as Barca set their sights on a cash-plus-player deal for their controversial Uruguayan target. However, with the Chilean ace reportedly preferring a move to rivals Arsenal, the plot thickens as to where his final destination will be. 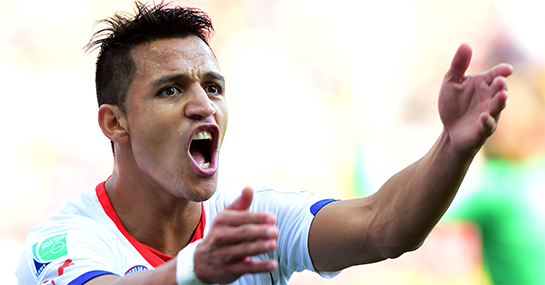 Here at Ladbrokes News we’re urging Sanchez to say “stick it up your Arsene, Wenger”. Chile’s star man should let nature take its course, allow Suarez an easy exit and make the move to Merseyside. With Luis Suarez ushered out of the back door, in admittedly the most public way possible, Sanchez can slot right in and form a lethal partnership with Daniel Sturridge. SAS Pt. II, or SAS the sequel if you prefer, would be an exciting combination. Sanchez’s return of 23 goals in 50 games for club and country in 2013-14 is none too shabby given he’s been playing in a side dominated by the brilliance of Lionel Messi. It’s time for you to step up and be the main man, Alexis. Even exceptional players need great wingmen. And Napoli’s Eduardo Vargas has proved that theory this summer by proving to be the perfect foil for the subject of this piece. Raheem Sterling can be Sanchez’s club side equivalent and help fire 15/2 Liverpool to a first Barclays Premier League title. Come on Alexis. Do you want to be playing up top with the one-paced Oliver Giroud? Relying on the Frenchman’s knockdowns and then waiting endlessly for him to clamber into the box for a return ball? No, sir. Let Steven Gerrard keep your appetite for the ball whetted. Dovetail with Sturridge, Sterling and Coutinho. Whatever you do, just don’t go to Arsenal.